1) Stand with feet shoulder-width apart, toes sticking to the ground. Bend and close in knees into half-way crouching position with buttocks drawn in. Reach out arms to parallel posi- tion, palm facing upward and fingers apart and relaxed. Also relax wrist, elbow, waist, and in particular, shoulder. 2) Hold head and neck erect, with chin slightly drawn inward and tongue against upper jaw. Keep body upright and stick feet inward to the ground. corners of mouth as if to smile. The practice of Riyuezhuang on the basis of Hunyuanzhuang aims at enriching the inner vitality of the practitioner to such an extent that he will remain immovable, through the plucking of “cream from both the earth and heaven,” under the enemy’s hooking or kicking attacks. Thus he may concentrate all his strength for the dexterous employment of the capture skills. 1) Keep torso upright and look straight forward. Other essentials are the same as those in Hunyuanzhuang. 2) Riyuezhuang takes the practitioner less time to reach stillness than Hunyuanzhuang and is, therefore, more effective. Spontaneous movements, however, should be controlled if they are too violent. 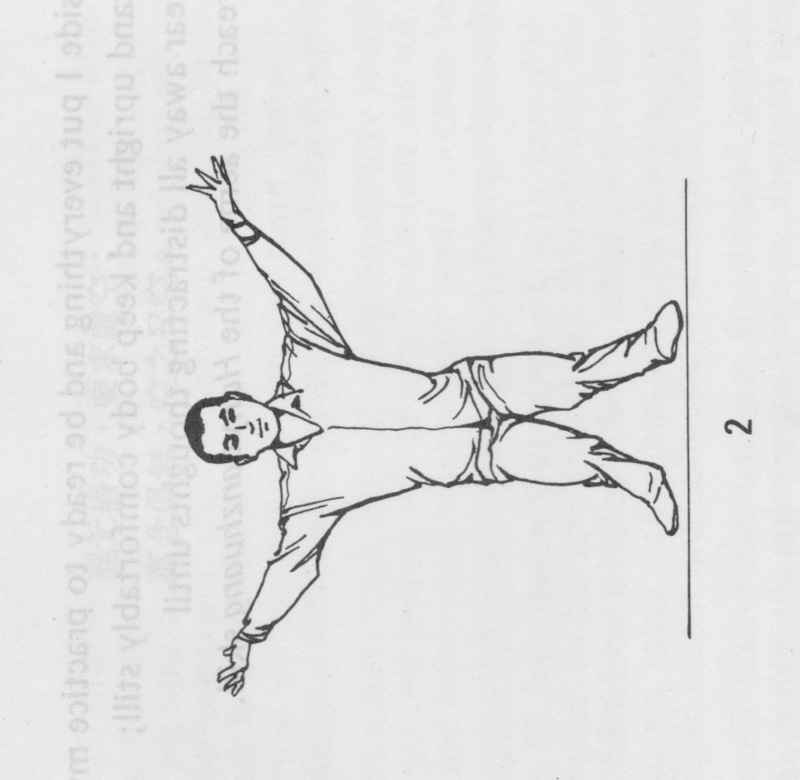 3) When inner Qigong is activated in the practice of this Zhuanggong, the practitioner might jump up, despite of himself, as high as three feet. He should be mentally prepared for such an amazing phenomenon. The height of the jump and the steadiness which he drops to the ground reflect the level of expertise he has acquired through practice Riyuezhuang. 4) Salivation during practice is the result of the smooth circulation of your breath and blood and the activation of your vital energy. Gradually swallow saliva and do not lose it in your relaxation because it is precious secretion from your body. 1) Beginners can hardly stand in this posture for more than – three or five minutes. As he goes on with the practice, he will gradually bring out his inner skills which will enable him to stand for as long as two hours, showing that he has already enough skills in the practice of Riyuezhuang. 2) After the practitioner reaches the state of stillness, the activation of his body begins from his fingers, small fingers in particular, in the form of a slight shaking movement, and goes to the wrists, elbows, shoulders and then to the waist until finally the vital energy passes through the Yinmen, Weizhong, Chengshan and Kunlun acupoints on the legs to bring him up in the air. Such technique is most useful in an actual situation. The above postures are two primary postures of Zhuanggong ‘ in the martial arts of the Jingang-Chan Natural School. Since there is no “Yin” (the feminine and the negative) and “Yang’ (the masculine and the positive) involved in the two postures, the “cream of the earth and heaven” can be easily plucked. The same rhyme used in the practice of Hunyuanzhuan may be applicable here except for a change of the term ‘Hunyuanzhuang” into “Riyuezhuang” in the rhyme.